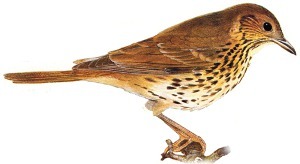 The Song Thrush has a plain dark brown back and head, it's throat and underside is white with large brown spots. The bird sometimes has a warm buff colouration to either side of the breast. Common resident breeder in most of Europe including very North where it is a summer visitor. Resident throughout the UK but numbers have dwindled in recent years and it is now considered a red list species. UK numbers can increase in winter due to migrants. Woodland, scrub, parks and gardens. Frequently hunts on lawns and short grass for worms. 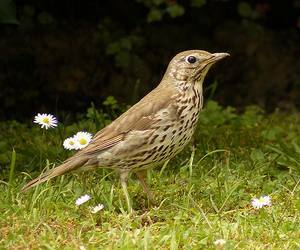 The Song Thrush as it's name suggests is a wonderful songster with a vocabulary of over 100 sounds. It's primary food source is worms and snails but in autumn it becomes preoccupied with berries. Fantastic video of Song Thrush, note plain brown back and wings of bird. Note the plain brown back and wings. The dots on a Song Thrush tend to be streaked on the throat and cheeks as in this image. Note: The Redwing can appear similar to the Song Thrush but has a strong pale eye stripe and dark red on flanks.